For me, this simple, classic, combination forms part of a near-perfect quick and easy weekday breakfast, along with a grapefruit and a swimming-pool sized cup of tea (Yorkshire Gold comes very highly recommended). Everyone has their own personal preference when it comes to the preparation of eggs and bacon, but this is the method I use on a daily basis, which is exceedingly quick, and introduces no extra, unnecessary (in my opinion, that is) fat. NB – if you are in any way, shape, or form, offended or made nervous by the usage of microwave ovens, it might be a good idea to look away now…. NB II – all the timings I give below are for my rather small 700 watt microwave oven. Firstly, take your bacon and egg out of the fridge in good time before cooking them – they will cook a lot better and easier if at room temperature. My choice here is for a smoked, back bacon, with a little but not too much fat. I prefer to cook my bacon on a microwave crisper, such as this one from Lakeland in the UK. 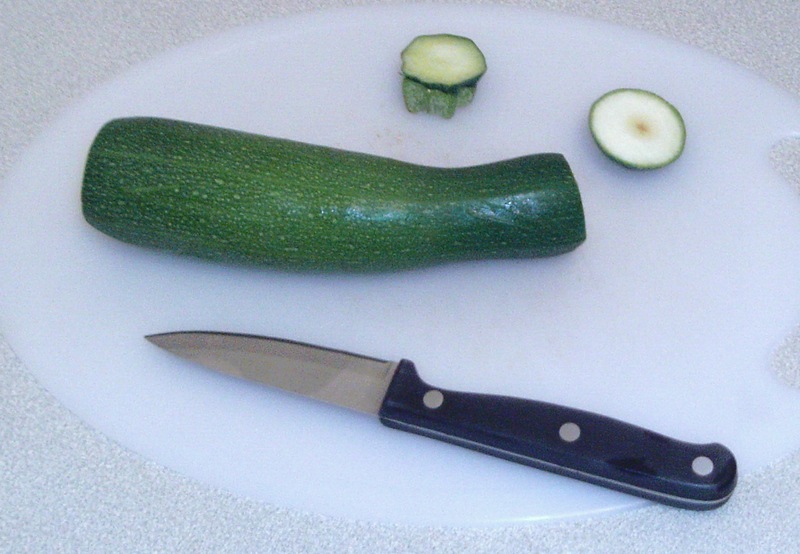 With my microwave this gives a cooking time of approximately 1 minute 45 seconds. The ribbed construction of the crisper allows the excess fat and water in the bacon to drain away, rather than letting the bacon swim in them, as it would in a frying pan. The egg should of course if possible be free range. 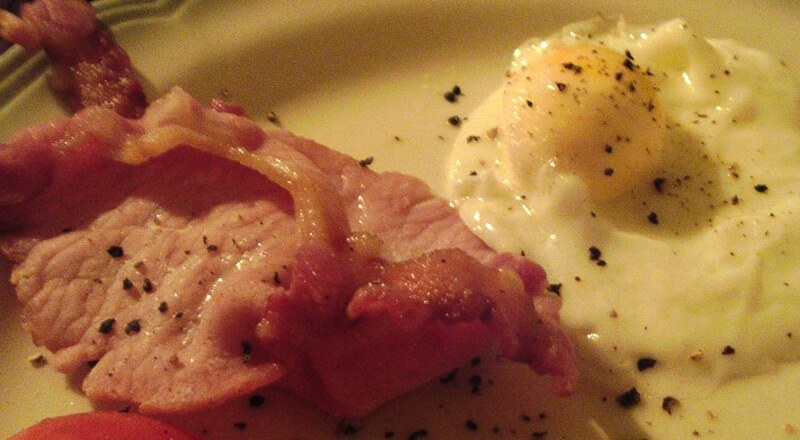 I have always preferred poached eggs to fried, but we all know just how fiddly they can be, right kids? Well, after much experimentation, I have perfected a microwave based method that just works for me, and has, so far and due entirely to my own negligence (read – setting too long a cooking time! ), resulted in only 1 exploding egg. The secret seems to be in the volume of water the egg is poached in. The microwave friendly container I use, for example, has a capacity of just 400ml, but works very well. I simply fill it with tap water to just over half-full, crack the egg, and then slide it into the water. I then cook on high power for about 1 minute 45 seconds. I now check to see if the egg is cooked to my liking, and if not cook for another 30 seconds or so, which usually does the trick. All that’s left to do is serve the egg and bacon, with a good blast of black pepper, and some fresh, sliced tomatoes. Heavenly! This entry was posted in Food Diary, how-to and tagged bacon, breakfast, egg, howto, paleo on August 6, 2014 by paleovirtus. 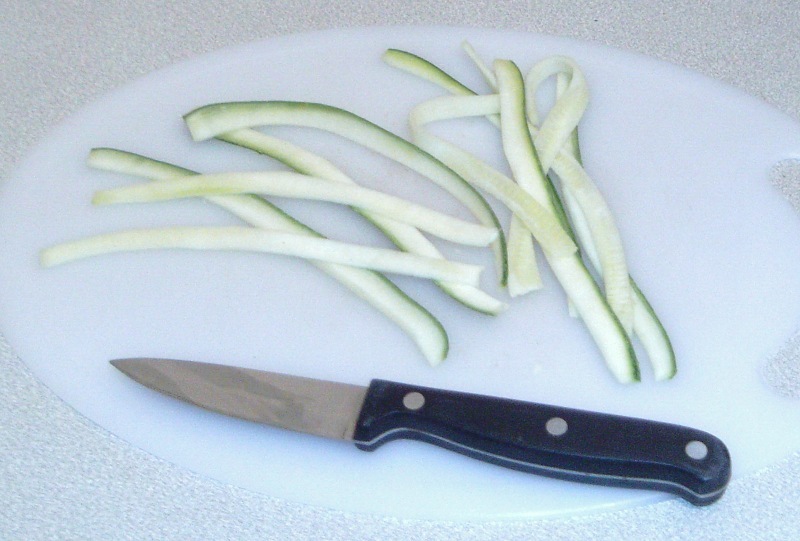 Let’s be honest here, Paleo pals, zucchini pasta, along with cauliflower rice and a selection from the range of Paleo bread recipes available, is more or less a “must have” in your culinary repertoire. I am a true blue, dyed in the wool Yorkshireman, and as such have a very real aversion to parting with brass when not absolutely necessary, and so the prospect of forking out for a rather expensive kitchen gadget when I already had the tools in my drawer to accomplish the task was simply not to be entertained. 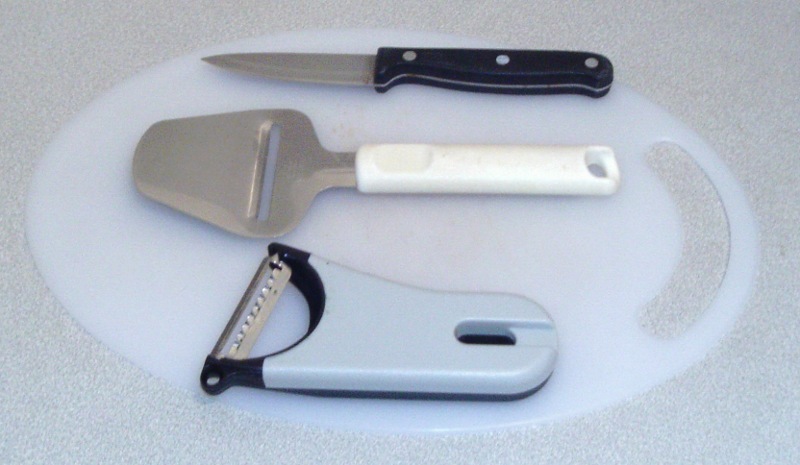 Top to bottom – a good, sharp, vegetable knife, a cheese plane, and a julienne peeler. That’s it. 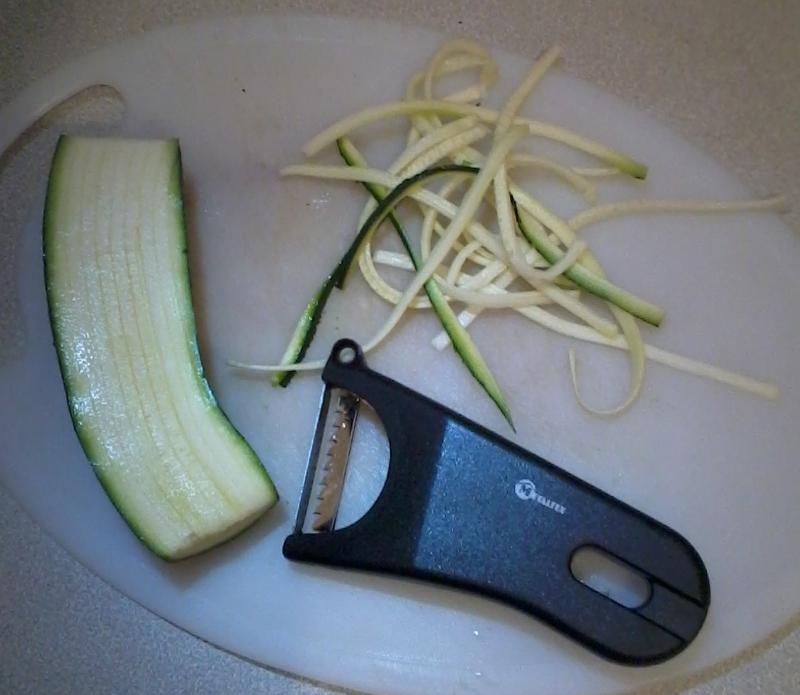 And then finally using your vegetable knife, slice the strips into tagliatelle. Job done. 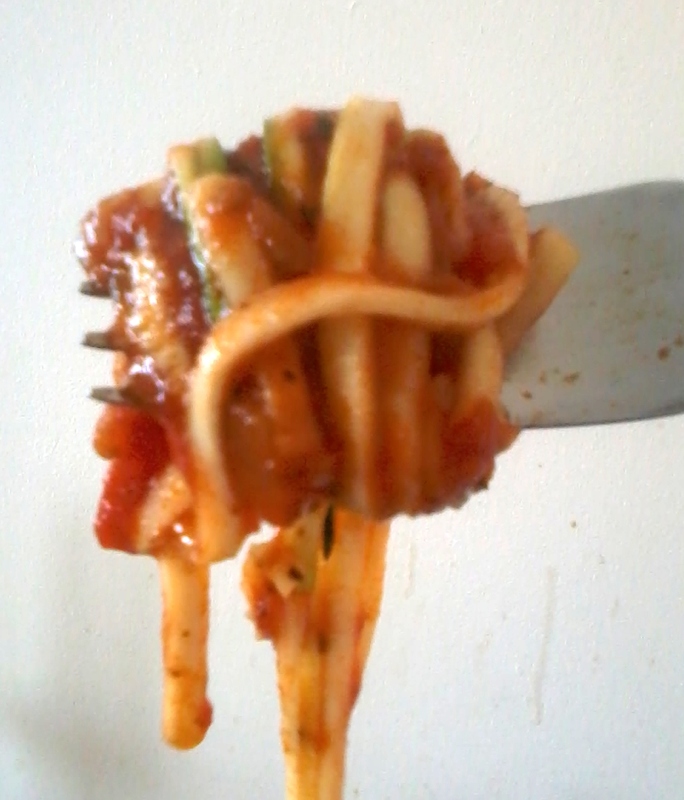 My own personal preference is to eat the pasta raw – nice and “al dente”! 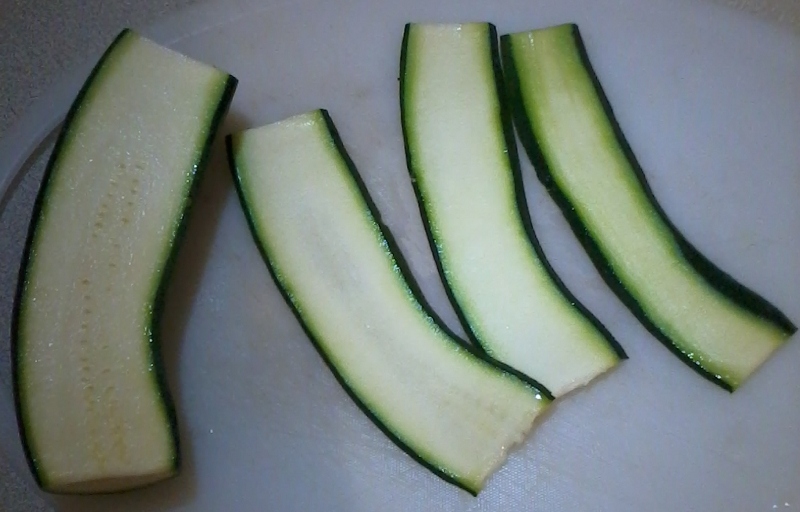 This entry was posted in how-to, Recipes and tagged how-to, paleo, recipe, zucchini pasta on August 2, 2014 by paleovirtus.